My first experience with a gas mask was on Parris Island, when I entered United States Marine Corps boot camp. We had gone through various classes on how to operate our gas masks and were properly fitted before we were issued our personal mask. We also received instruction on other issued gear in order to have better protection against various NBC (nuclear, biological, chemical) attacks. Do You Have A Gas Mask in Your Survival Kit? Once we completed hours of instruction, as well as practice with our NBC gear, it was time to put our equipment to the test. I heard about the dreaded “gas chamber” well before I ever stepped off the bus that brought me to where U.S. Marines are made. None of us mentioned the gas chamber in detail, but we all held in that bit of fear from the tales that we were told about the infamous gas chamber. We were taken to a location that looked like most of the other buildings on Parris Island. I remember lining up in formation with my gas mask, alongside my fellow recruits. One of my drill instructor’s began to brief us on what was expected, once we entered the gas chamber. Nerves began to set in as I realized that… This Was It! We were instructed to don our gas masks as we began to enter the building in a single file. At this point… We filled in the gaps as we faced the center of the room, with our backs against the wall. We could see clearly as the gas began to fill the room. Then, we were told by our instructors to begin performing side-straddle hops (jumping jacks.) As my heart rate began to climb, I was told to get on the ground and begin performing pushups. Remove your gas mask Now… MOVE! As you can imagine, we were all quite reluctant to remove our masks… but let’s just say that we really didn’t have a choice. One by one we began removing our masks. It was probably the slowest movement that I had seen from my fellow recruits up to that point. I heard one recruit cough followed by a symphony of other coughs. Some recruits were doing their very best to hold in their breath, but it was just a matter of time until the exposure to the gas set in. Our drill instructor was still wearing his mask when his next command was for us to begin singing The Marines’ Hymn. Some of us began to murmur the lyrics as our D.I., screamed, for us to Sound-Off or we would be repeating this process all over again. As we began belting out The Marines’ Hymn, at the top of our lungs… That’s when all HELL broke loose. Some of us were coughing while others were vomiting. It felt as if there were streams of mucus coming from every orifice on my face. At this point, none of us could see due to the irritation the CS gas was causing our eyes. Everyone was having trouble breathing and the sounds of panic and pain drained out the further instruction from our D.I. We began pushing at the recruit in front of us, in shear panic, nudging them closer and closer to the exit. Finally, the door to the gas chamber flung opened and we all came charging out. We were told not to rub our eyes with our hands but unfortunately… Some recruits did; Just out of mere anxiety. This made things worse because we were transferring the CS gas, that had landed on our hands, back onto our eyes. Some Marines were hunched over and gagging, while others were dousing their eyes with the water from their canteens. I gained a lot of respect for the gas mask and it’s capabilities, within that training session. Once again, experience seems to have been the best teacher. I realized that if I were ever caught in a situation, where I needed to operate in an area where tear gas was being dispersed… Donning a gas mask, first, was a must! There are a lot of falsehoods when it comes to gas masks. Learning the proper uses for the gas mask, as well as its limitations, is crucial if you plan on using your gas mask during an emergency. Your mask can easily become a liability and cause you serious harm if your understanding and experience with the mask is limited. As I previously stated, there are countless options when it comes to choosing a gas mask. Prices range from inexpensive military surplus, to others that can cost you a small fortune. As always, there is never a one-size-fits-all. 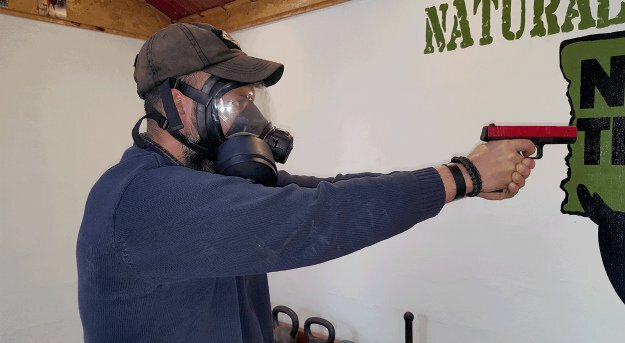 You need to find what works best for you and if adding a gas mask to your kit… Is even something that you should consider. Everyone has an opinion on the subject. It is up to you to gather the information to make a proper decision for both you and your family. Let’s get into a few considerations when adding a gas mask to your kit. I have a gas mask as part of my survival kit. However… I currently have a beard. What that means to me is that if I don my mask while having a beard, there won’t be a proper seal formed between the mask and my face. This will render the mask useless during an emergency scenario. This is something that anyone with facial hair needs to be aware of. My current go-to mask is the MSA Millennium. MSA states that any beard, longer than ½ inch, is a no-go. Other manufacturers have even more stringent requirements. A mask needs to fit properly in order for it to be effective. Many of the SWAT police officers that I work with state that they have to get fitted (certified) twice per year when it comes to their gas masks. If this wasn’t such a great concern, I’m sure that allotted time and money would be invested in other, more pertinent, trainings. Gas masks are generally useless when it comes to fitting well on children. I have come across various models that are designed for children but the more research that I did, the more that those claims became debunked. What Will Your Gas Mask Protect Against? Unfortunately, the protection offered by your gas mask is more limited than most are aware of. Depending on the filter that you use with your mask, not all types of attacks will be covered. Some filters only protect against tear gas while other, very expensive filters, can protect against nuclear, biological, radiological and chemical attacks. But you must keep in mind that even the expensive filters are only protecting your eyes and lungs. When nerve gas such as Sarin, leaches onto other parts of your body, you will still be exposed to it’s harmful effects. When it comes to biological concerns such as Anthrax, you can be exposed to it for days without even being aware of it’s presence. So unless you are donning your mask 24/7, you are still exposed to the threat. There are plenty of reasons where I feel that my gas mask will serve me well. If you have followed the news in recent times and see how governments around the world are reacting to their citizens. Whether it’s a public demonstration or march, CS and other tear gas are utilized in order to control the public. Keeping that in mind, my gas mask will still allow me to operate effectively in those conditions. In addition, during a crisis others may try to get into my home in order to gain supplies. Attempting to clear my home by utilizing tear gas, which is easily gathered these days, may be a threat that my gas mask will protect me against. You may not think much about hydration while donning a gas mask. But if you have spent extended time, wearing a gas mask, you will quickly realize that this is a concern. Not only does the labored breathing contribute to dehydration but it also causes me to sweat. If you are performing work while wearing your mask… Having access to water is something that has to be factored into your plan. Luckily, many of the quality masks available in today’s market come with a hydration hose. The hose is designed to be affixed to a canteen or other water container. The water containers need to be designed for this specific purpose but even my old, military issued canteens, can fill this niche. I can fasten the hose on my mask, to my water container, and drink through a water spout contained inside my mask. It is similar to the process used when drinking out of a hose from a hydration reservoir. Another facet of wearing a gas mask, that is often overlooked, is the ability to communicate effectively. If you have heard someone speak through a typical gas mask, it is a cross between listening to someone talk underwater and Darth Vader giving a speech. In an emergency, there will be plenty of noise that will prevent your communication from being effectively understood. Add in the labored breathing caused from doing work as well as struggling to get air through your filter… And verbal communication may be impossible. Luckily, there are voice amplifiers that can be easily affixed to your gas mask. The downside is that these amplifiers cost as much, if not more than, the actual gas mask. Working with your team on hand signals as well as other body-language communications is something that needs to be addressed sooner than later. As with any other piece of survival gear, if you do not have immediate access to your mask during an emergency, it is basically useless. Where we stage our gas masks is half the battle if we hope to bode well during the crisis. Many suggest that having multiple gas masks staged with your go bags is ideal. I would certainly agree with that if you have an endless budget. Today’s quality gas masks are expensive. When we add in filters, amplifiers and other components, we can easily exceed our budget. If we need to replicate the process with additional masks… Well that may not be an option for most of us. You can also get a great deal on military surplus masks but please keep in mind that you will get what you pay for. I keep my gas mask attached to the molle webbing on my main go bag. If an emergency were to occur, I can easily gain access to my mask. If I have ample warning, I will keep my gas mask fastened to my leg, where it will be, At The Ready. There is a small percentage of people that will feel claustrophobic when donning a gas mask. The one way to best see how you will react when wearing a gas mask is to practice various emergency scenarios while wearing a gas mask. Just sitting on your couch and watching tv with your gas mask on will tell you a lot about your comfort level with your mask. Taking it up a notch by performing real work while donning your mask, will give you a better grasp on how you will operate during an emergency. Every task will become that much more difficult while wearing a gas mask. You need to train with your firearms as well as any other self defense tools that you plan on using in an emergency situation. 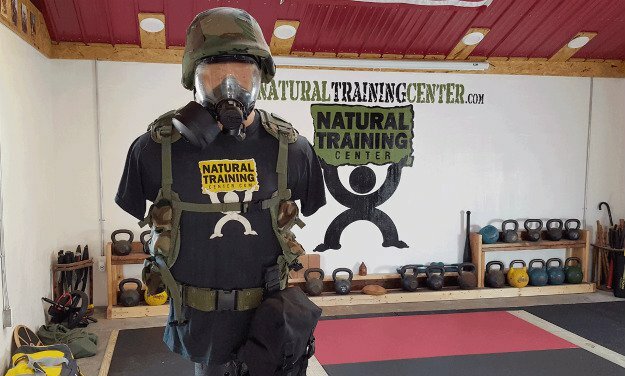 If you wait until the actual crisis to experiment with your gas mask, or any other piece of survival gear for that matter… you are not only putting yourself at risk but also deterring from your family’s chances of surviving when SHTF. The gas mask is a piece of gear that I feel will add to my chances of performing well during an emergency. It is not the answer for every type of NBCR attack that we have the potential of facing. But as the guy that my friends and family will look to for help during a crisis, I will take any advantage that I can possibly get. If it is an extra hour or even just an extra minute… The added benefit of having a quality gas mask is well worth the price and effort, at least for my needs. Will you add a gas mask to your survival kit? Let us know in the comment section below. Check Out The Gun Carrier Store!